So like most I am so excited for the warmer weather and beautiful spring colors. So far spring seems to be taking its time to get here. I have been somewhat inspired by the season to create a mani from the spring equinox sky which I found on google. The image is of the night sky with stars swirling around in night sky. The colors look like to navy, purple, white and orange. I tried a couple of different ways to all the colors, but I could make it work. I finally settled on adding a light blue since I was trying to turn this into a spring mani. A lot of the items that I used are from Maniology. So let's get into steps again I sorry no video for this post and few photos. 1) You want to start with clean nails and then add a base coat. I used Maniology base coat, or sometimes I use Sally Hansen quick dry base and top coat. 2) For some of the nails, I painted them with two coats of Celestial I wait for a bit and added Maniology speedy dry top coat. The other nails I stamped on. I painted in the color moonglow, two coats and added speedy dry. Let dry and stated the stamping. 3) I am using my creative shop stamper, scraper, and maniology mat. For nail plates, I am using all Maniology. BM -418 or you could use BM-XL210. You want to have something that will give that swirling movement so any nail plate will do if it has that pattern. I used Marzipan (purple) and Celestial (navy) to stamp the image out. I mix the colors the best that could with my scraper. You have to work quickly because stamping polish does dry fast. I also want to say that after you stamp an image using 100% pure acetone, cleaning the plate so you can stamp out the design again. 4) For more defined stars I used BM-XL213, I also would have used BM- XL201, or any star nail design would work. You also may want to use some barrier to protect your skin and for less cleanup. Polishes that I used for the stars are Bam white and coconut. Just a step three, quickly working, stamp out the stars, clean the plate and I did this for all four of my fingers on both of my hands. 5) Take off your nail barrier. 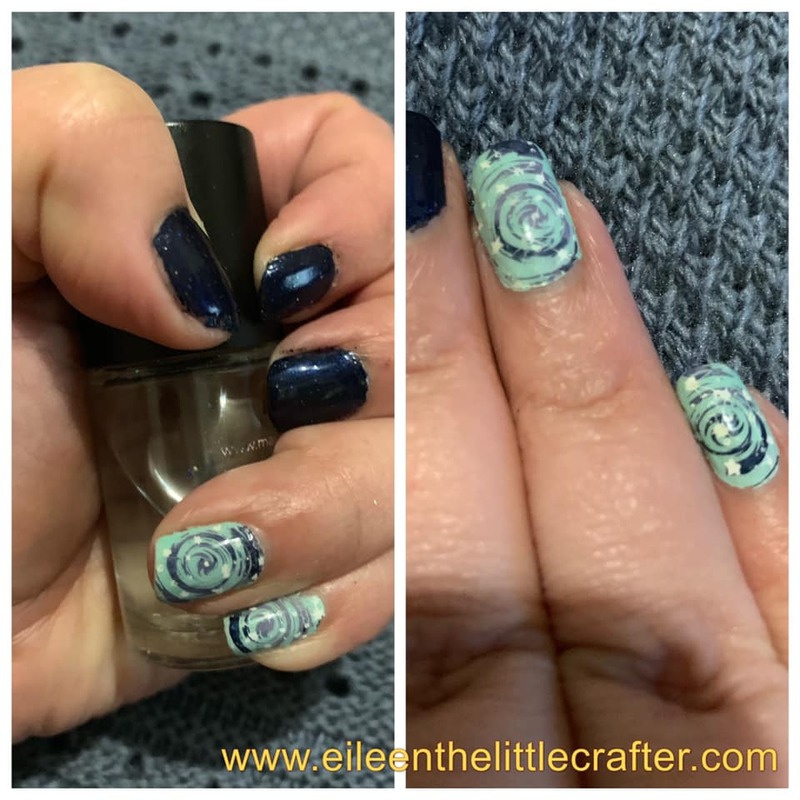 Once that is done, you can clean up now, or you can add smudge free top coat because sometimes some topcoat nail polish will ruin your stamping. Let the smudge-free polish dry, clean up all your nails if you have to add a shiny or matte top coat to your finish mani. All items are some maniology, if you don't see a linked, no longer on their site.